Apple trees are actually very easy to grow, particularly in the ground. In containers they need a little more TLC to check that they’re fed, watered and healthy, but even still, they’re also fairly straightforward. Now’s the time to get bare-root trees going. They’re available to buy from now until early spring, but are better able to establish well in the plant’s initial stages due to stronger root systems. Siting is important. Apples prefer good sun, but can tolerate a few hours of shade a day. They like loamy, well-drained soil and relative shelter. 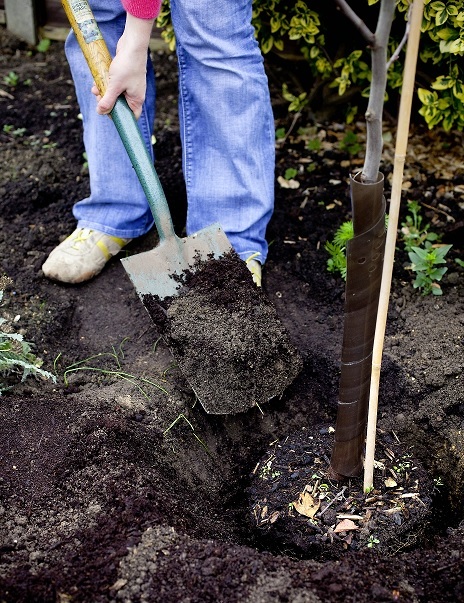 If you improve the soil just before planting, restricted to the planting hole, it may mean roots feel too comfortable where they are and don’t extend to make for a strong, stable plant. If possible, improve the whole area weeks beforehand so all of its surroundings will be attractive to the roots and it’ll want to spread out more. Along with many other fruit trees and bushes, apples fruit well if they’ve a pollinating partner to help. Have your neighbours got apple trees close by? If so, that may be enough for your tree to succeed. If not, consider planting two or more apples if you’ve space. So-called ‘family apple trees’ are available from good online nurseries such as Pomona Fruits or Thompson & Morgan, which have two or three apples grafted on to the same tree – a real space-saver that’ll solve your pollination problem.